The structure of periodic metallic slits with asymmetric binary grooves is proposed to reduce the width of the transmission peak due to the similar Fabry-Perot (F-P) resonances. It is well known that the F-P resonance in a slit can enhance the transmission and performs as a peak in the spectrum. However, the groove F-P resonance appeared as a dip in the spectrum. In the proposed structure, by coupling the slit and the groove modes, the width of transmission peak can be reduced due to the two dips introduced by the asymmetric binary grooves. 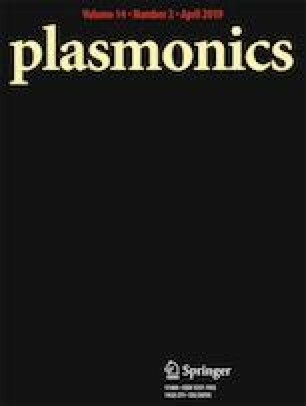 The proposed plasmonic structure is promising in application of improving the quality factor, sensing sensitivity, and narrow band filters. The National Natural Science Foundation of China (Grant no. 61671008); Natural Science Foundation of Guangxi Province (Grant nos. 2018GXNSFBA281175, 2018GXNSFAA281163); Science and Technology Projects of Guangxi Province (Grant nos. AD18281033, AD18281041); Guangxi Key Laboratory of Automatic Detecting Technology and Instruments (Grant No. YQ17103); Guangxi Key Laboratory of Opto-electronic Information Processing (Grant no. GD18106).